Kevin has been active in motorsports for some 40 years. He has competed locally and internationally in tractor pulling, snowmobile and stock car racing. He started competing in tractor pulling in 1976 with a stock farm tractor, a 26hp Cockshutt 40, at the young age of 13 in Woodstock, NB. He won that pull. The following weekend in Presque Isle Maine he won, but was disqualified for being underage. This began his career in tractor pulling. 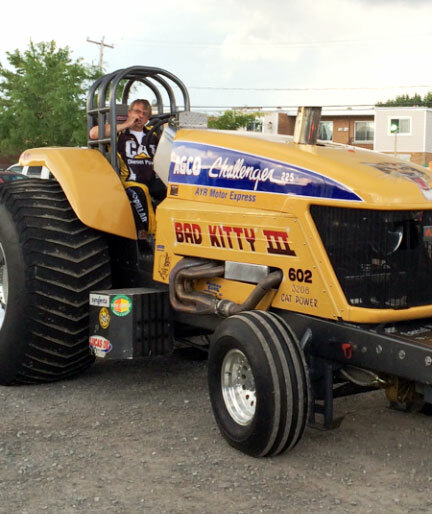 He has become one of the strongest competitors in tractor pulling in the region. After competing for several years with stock farm tractors, he started to build his own 10,000 pound Pro Stock Tractor, “Bad Kitty One”; it had a turbocharger 3208 Caterpillar V8 diesel engine. He has developed the tractor over the years by building “Bad Kitty Two and Three”. It would be very difficult to list all events and his placements.